A term most of us are by now familiar with is spam. We all get these junk e-mails with a subject line that says interesting things like “I love you” or “Thank god I found you” among others. We refer to them as junk e-mail because that’s what they are, junk e-mails, similar to the junk mails we get in our mailboxes. We call them junk because first of all they are unwanted and unsolicited, and second, they are often useless and provide no value such as good information or some type of reward. Professionals refer to them as Unsolicited Bulk Email (UBE) or Unsolicited Commercial E-mail (UCE). These e-mails typically have good purposes for the sender like advertisements for products and services. We receive a lot of spam e-mails, almost daily, some suggesting that we buy certain junk stocks. What else can we expect; junk e-mails can only refer us to junk products, services or stocks. Considering the origin of spam, reputable companies would not send us junk e-mails advertising junk stuff, or they would no longer be reputable. The intended purpose of unwanted e-mails may be pyramid scam or other “get rich quick” scams or may be phishing, which is a scam in which the sender pretends to be a legitimate business you can relate to like your bank, and through a link in the e-mail refers you to a web site with a look and feel of your bank, and entices you to provide important information about you. The information you provide is then used for identity theft purposes to commit financial fraud or other crimes under your name as explained in the Overview section. Now that we understand what these killer spam e-mails are, let’s talk about how in the world the senders are able to get our e-mail addresses to send us these junk e-mails in the first place. Spammers usually either buy our e-mail addresses in bulk from other companies or they use software programs called bots to automatically collect our e-mail addresses from the web. That’s why we have to be careful not to share our e-mails too often with web sites, groups or people we don’t know. It’s also a good idea to learn how companies intend to use our e-mail addresses before sharing with them. To find out how exposed you are to these scammers, go ahead and type your e-mail address in Yahoo or Google search bar and notice how many times your e-mail address comes up. You’re lucky if nothing comes up. Scammers may also send thousands of e-mails to guessed e-mail addresses. They try all kind of e-mail combination and once they know how e-mail addresses are created in a company like firstname.lastname@zzz.com, they have a better chance to reach their employees. They don’t care if most of their e-mails bounce back because first of all they don’t spend a lot of time creating them and that’s why most of them look like garbage, and second, it doesn't cost them any thing to send them out. Scammers will send millions of e-mails hoping just to get a few desired responses. They are creative and use many techniques to hide the origin of their e-mails, such as place a real name in the sender’s line that you may recognize and consider a friend which is also called a spoofed e-mail, and use attractive subjects like “you are a winner” or “claim your prize” to entice readers to open and read the junk e-mails. Spammers may send the e-mails from any email service provider like Yahoo, Google, or Hotmail. They may relay their e-mails through the e-mail server of a third party, and that costs companies a lot of money, not only in terms of bandwidth but also defending themselves when they get investigated for an e-mail that was “supposedly” originated from their mail server. Or, they may also change the header of an e-mail and make it appear as if it was coming from another origin (also called spoofed e-mail). If they get detected by ISPs and removed, they move to another ISP and open a new account to start all over again. One way you can help the fight against excessive and unsolicited e-mails is to report them. Whether you get e-mails from reputable service providers like Yahoo or Google, or at work, you should report all these e-mails. There are now advanced filtering services and spam blocker tools that companies use to fight junk e-mails and they get better every day but we have not won the fight against spammers because they are very clever and creative and find new ways to get around the sophisticated systems, and also because there are no real and effective laws to take spammers to court and even then it may cost companies a lot of money, effort and time to successfully prosecute spammers. The way these filtering services work is they flag junk and unwanted e-mails after recognizing them by the nature of the e-mails such as bulk e-mails, with modified header or untrusted and unrecognized origin of spam. The e-mails are then quarantined in a special folder called junk e-mail. 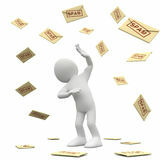 The filtering rules can be changed by the e-mail system administrator to be less or more stringent. Usually, the junk e-mails placed in these special folders are automatically deleted if the recipient is not interested in keeping them after careful review. One important downside of these filtering services is false positive which means that the software may flag legitimate and important e-mails as junk and delete them without your knowledge. This can happen and has happened many times, especially when we are waiting impatiently for very important emails. And by the way, after you report the junk e-mails, delete the e-mails and don’t even open them. Opening these bad e-mails which may contain hidden and deadly viruses can kill your computer and in some cases can bring the entire network of your organization down. Return to home page and learn about other types of spam.